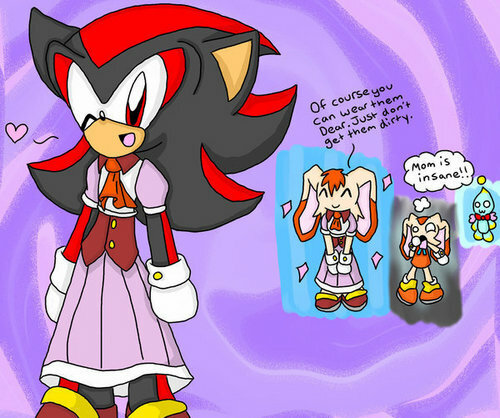 shadow wearing vanillas dress ...XD. loool shadow. Wallpaper and background images in the Sonic the Hedgehog club. THE SHADOW WEARING ________'S CLOTHS! *SCREAMS* O MY GOD! SHADOWS GONE GAY!!! !ITS THE END 4 SONIC AND SILVER!!!!!!!! !THIER GONNA GET HUMPED 2 DEATH!!! !AND WHATS WRONG WITH U VANILLA!!!!! work it shadow! work it! @katkat57 thank u for being smart! I completely agree shadow isn't and never will be gay!